I write this blog with mixed feelings. Simply because my husband is not a feeling sharer. I honestly don't know what he is thinking about today, or if he even thinks about it. But that is kind of the point of my blog. We sometimes forget that the men can be just as much as affected by this whole infertility thing. First, my husband loves me more than I deserve to be loved on most days. This also makes him want to protect me. He hates seeing me go through this month after month, day after day. But in reality, he is going through the same thing. Every failed ovulation is another reminder he won't be a Dad soon. Every failed pregnancy test reminds him he won't be a Dad anytime soon. Do we ever stop and ask how they are doing during all of this? I just came off a week vacation with my husbands side of the family. My husband loves and adores his Dad and got to spend a lot of time with him which was great. He also has an Uncle, Griff, whom he loves and adores just as much. Nathan had always seen then both as Father figures and goes to each one for different advice in his life. We have a 12 year old nephew who thinks Nathan is the coolest thing since sliced bread (which he is). He knows he will have a beach partner with him. Someone to take him out boogie boarding or watch him skim board. Someone who will play games with him. He is also someone who will explain the economic down turn to a 9 year old like he is taking to a co worker. He is also the same guy who tried to help Chance 'catch the tooth fairy' by duck taping the tooth to his hand (yes, we have pay backs coming for yearssss for the stunts Nathan has pulled). Nathan is just cool, and his nephew loves that about him. They have this amazing bond that is just there and it is amazing to watch. We also have a 5 year old nephew who might think I'm a tad cooler then Uncle Nathan (finally, someone gets it! ), but none the less he still thinks his Uncle Nathan is pretty cool! I don't know how many times I heard 'where's uncle Naffan' over the course of the week. At one point we were driving, just the two of us, and Nathan said that what Griff is to him, he is now to his nephews. I sat there for a moment and thought about it and realized it's the truth. We took the boys out one night and as we were walking a pier with them we both realized if being Aunt Amanda and Uncle Nathan is all we ever get to be in life, we are pretty dang lucky. Nathan loves his nephews with everything he is. And maybe someday Chance or Braydon will be telling their wives and children all the stories of their Uncle Nathan and how he has influenced their lives. So to all the childless Fathers on Father's Day wanting so desperately to have a child, look around at the other kids in your life. I bet one or two of them look up to you as if you were a father! 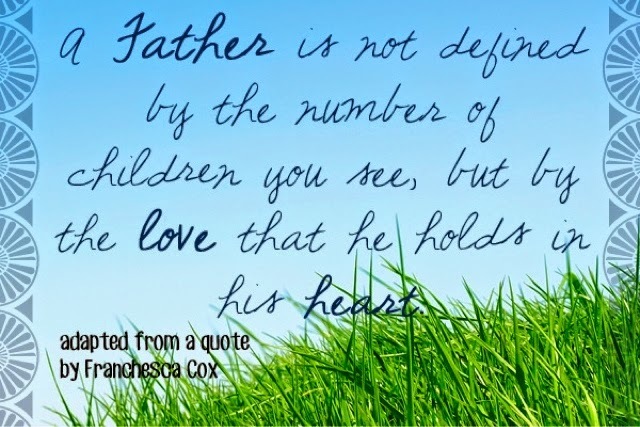 While I love this, I hope that next Father's Day that you and your hubby are holding your new baby or that he's laying a hand on your tummy and feeling him or her beneath.